What can I serve you? Coffee? Tea? It doesn’t matter what you’re drinking, you HAVE to have a slice of this amazing Torta de Santiago to go with it. 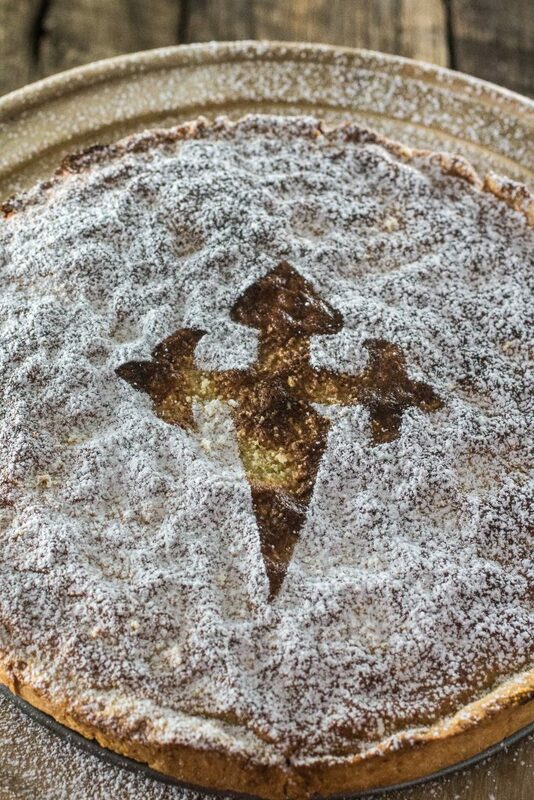 Torta de Santiago (in Galician) or Tarta de Santiago (in Spanish) means Pie or Cake of St. James and is a Spanish almond pie (or sometimes cake) that is said to have been originated in Galicia during the Middle Ages. It is specially popular among the pilgrims and tourists in Santiago de Compostela, the area where the remains of the apostle Santiago are believed to be buried. 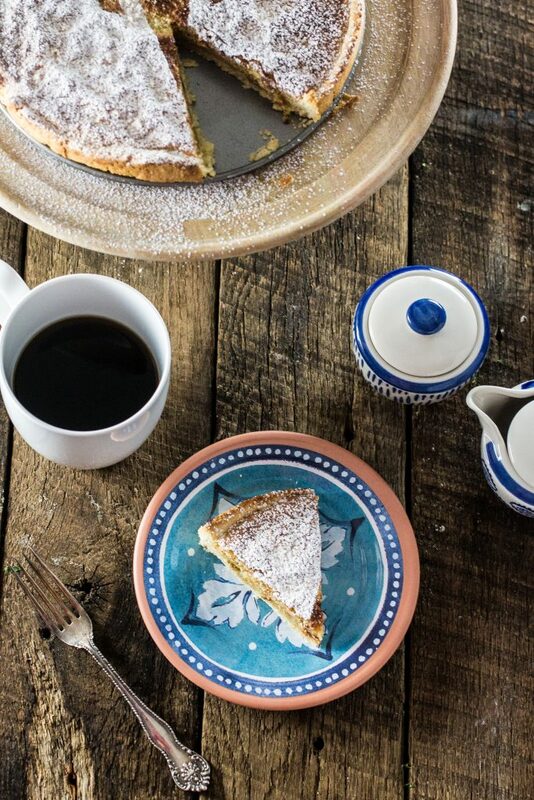 This pie/cake is so deliciously moist and not too sweet, perfect as a snack accompanied by a latte on a lazy afternoon. After I finished making this almond pie, I proudly looked at it and thought of my mom. Her dream is to go to do the pilgrimage to the cathedral of Santiago de Compostela, which is known to be a very spiritual experience! 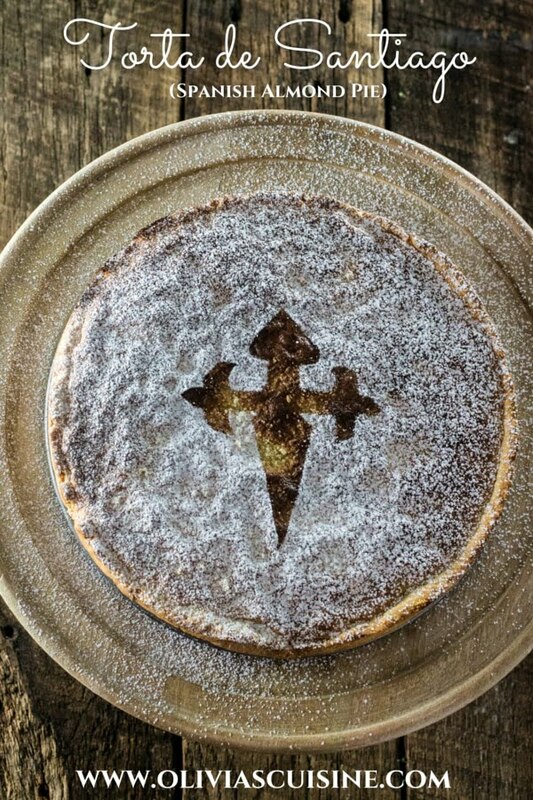 The traditional way to decorate this pie is to use a stencil of the cross of Santiago in the middle of the pie and sprinkle powdered sugar on top, so the cross is “printed” on the pie. I didn’t have a Santiago’s cross stencil and my printer is broken. So I draw one myself on a piece of cardboard and cut with a pair of kitchen scissors (that’s when I realized I had no regular scissor at home! Am I failing at adulthood or what?). 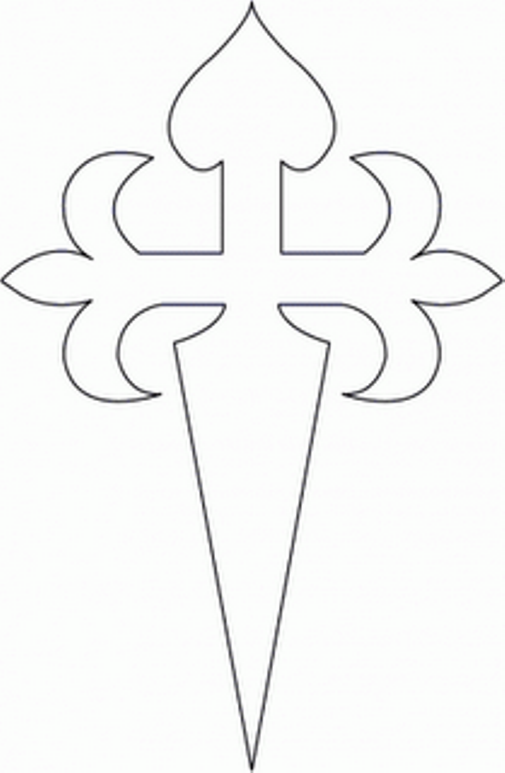 If you also wanna be traditional and have a working printer, print this stencil and use it as your mold and your cross will definitely look better than mine. In a large bowl, mix the flour and the sugar together. Add the rest of the ingredients and mix well until you have a smooth and consistent dough. Grease and dust a tart pan (or springform pan) with butter and flour. Reserve. Once the dough has chilled for 30 minutes, use your fingers to press the dough into the tart pan, taking care to push it into the sides. Pat until the crust is even and, using a fork, make some holes all over the bottom. Reserve. Preheat oven to 375 degrees with a rack in the middle. In the bowl of a stand mixer, add the sugar, the lime zest and the cinnamon. Mix on low just to combine. Mix in the 3/4 cup almond flour until smooth. 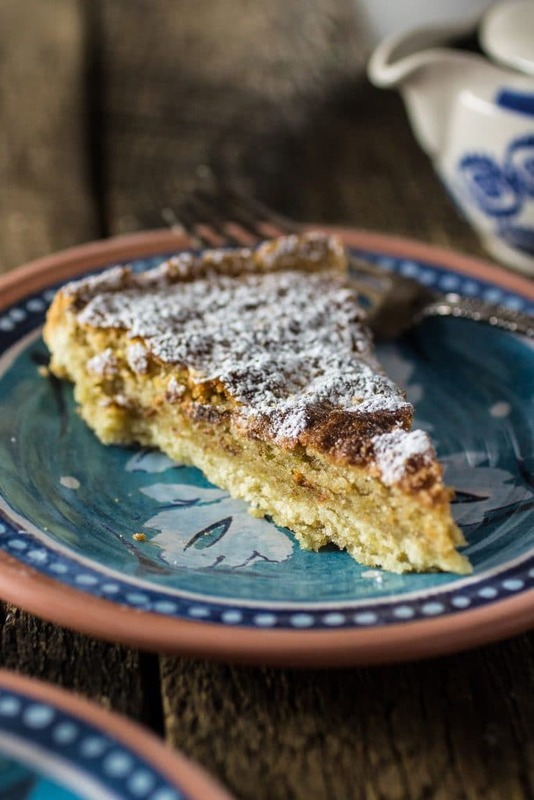 Pour the batter into the prepared tart pan and dust the remaining 2 tablespoons almond flour on top, for a crunchy finish. Bake for 30-40 minutes or until the top is golden brown and a tooth pick inserted in the middle comes out clean. Reserve to cool. Once the pie is cool, remove from the tart pan and transfer to a serving platter/stand. Place the Santiago cross in the middle and sprinkle confectioners sugar on top of the pie. Remove the cross to reveal the drawing. P.s. your cross looks good! Nossa, que coisa linda, Olivia! Me deu preguiça de escrever em inglês, mas, for dure, quando eu for ai, no dia em que eu chegar, é essa torta que eu quero provar!!! Wow I have never heard of this pie before Olivia, but it sounds so good! All I need now is a cup of coffee! What a beautiful cake, my friend. I’ve never heard about this pie before, but it looks so delicious and moist. I’m sure you could do the Camino if you wanted to, but it is important to work up to walking 12-15 miles a day. Of course it is not required that you do the entire 500 miles across Spain. You and you mother can get the Compostela certificate by doing 100 KM/60 miles. 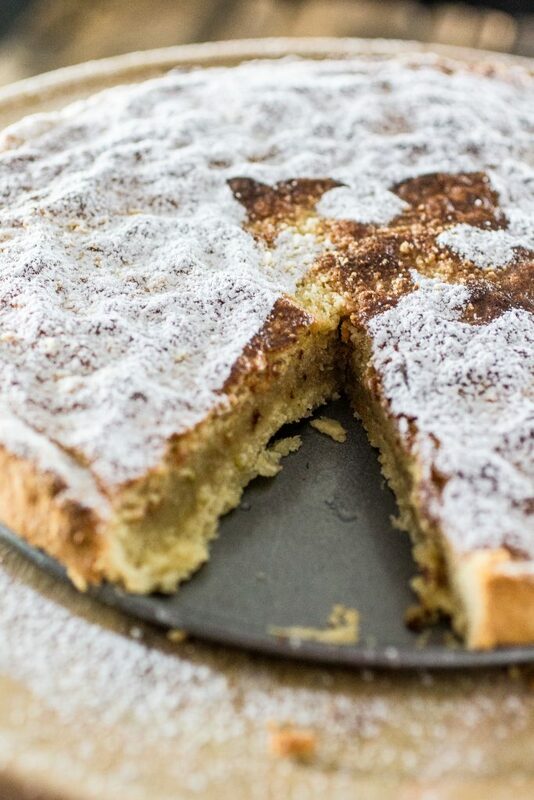 Looking forward to trying your version of this recipe for a couple of Camino gatherings–the pie is widely available in shops and restaurants in Galicia, but not in many places in the U.S.